Never Skip on Hair & Makeup! An important yet often overlooked investment for your wedding day is with makeup and hair. Among the others, hair and makeup should be at the top of your list. Any experienced photographer can tell you there is a noticeable difference in the photographs as result from a professional application. 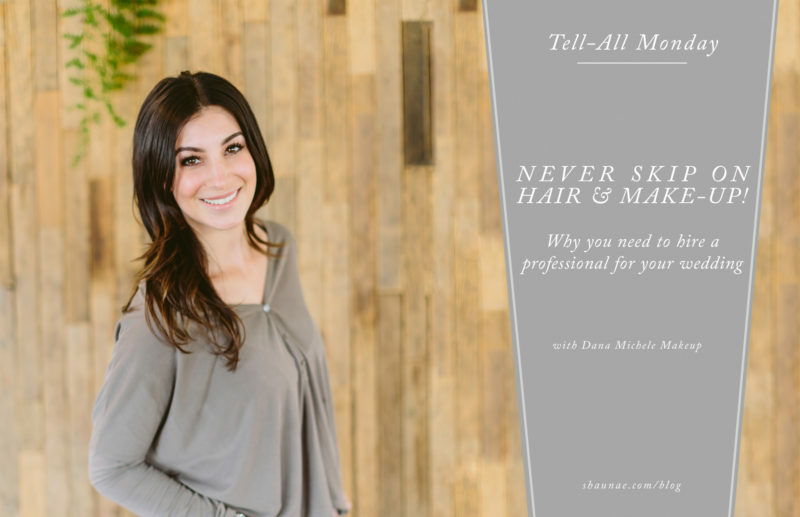 My esteemed friend, Shaunae Teske of Shaunae Teske Photography, was kind enough to feature me on her blog and share why it’s SO important to never skip out on professional hair & makeup! I love to work with Shaunae (I do most of the hair and make-up on her brides-to-be for their Engagement Sessions) . Her work speaks for itself as authentic and captivating, and it’s always inspiring to be around her uplifting energy! Why is it important to have a professional hair and make-up artist for my wedding? It is critical to have a professional in charge of your hair and makeup on your wedding day because it is your most photographed day. The pictures will stand the test of time and are passed down for generations to come. Having a professional means having someone with the education, experience, and knowledge of what is best for you as an individual. They will be able to guide you on what looks best, what will realistically work for your hair/skin type, and have the right tools to make sure your hair and makeup will last through the long day. When should I book my hair and make-up artist? What questions should I ask when looking for a hmu artist? You want to ask your HMU about products they use, education/experience they have, and how they can be of service to your specific needs. It’s always great to look at an artist’s work on their website or Instagram, as well as, what prior clients have to say about their experience. After you book with them, ask them what you need to do to be ready for them the day of, like moisturizing your face and having day-old hair. Keeping communication open is always necessary to make sure you are on the same page and are getting the look you want. Should I have my hair and make-up done for my Engagement Session? Why? Follow along on Shaunae’s adventures!